One of the perks of living in the Skagit Valley is being near the water. We don’t live close enough to Puget Sound to, say, go kayaking every morning (rats! ), but a half-hour’s drive gets us to a ferry terminal, a bayside walking trail, or a shellfish farm. 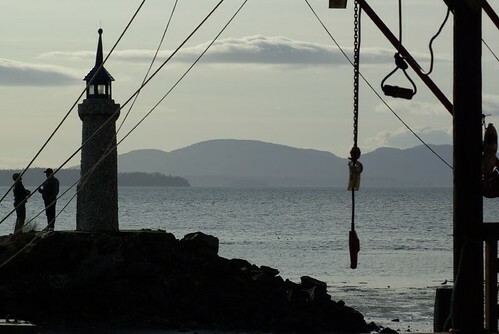 I visited Taylor Shellfish for the first time many years ago, as part of a Watershed Masters program I was in. We toured the facility, listened to a lecture on oyster reproduction in a big cold drafty room, then ate quantities of hot fresh oyster soup. I wasn’t actually a big fan of oyster soup, but I appreciated the gesture at the time. We’ve since been back to the farm a number of times to buy fresh clams, mussels, and (most recently) oysters. 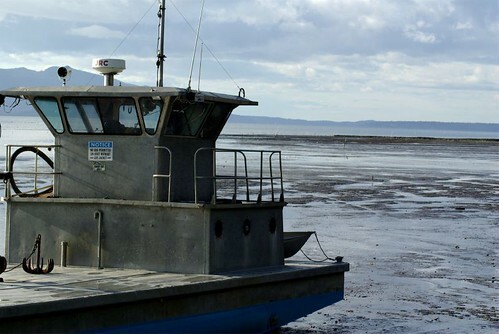 The retail shop is right on Samish Bay, near the mouth of Oyster Creek. 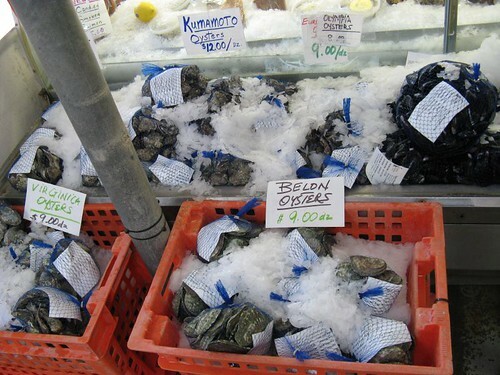 They sell shellfish and crabs, as well as oyster knives and a few sauces and seasonings, so if you want you can buy a bag of oysters and head straight out to one of their picnic tables on the water and eat them immediately. It doesn’t get much fresher than that. We only started eating raw oysters last year, after being shamed into trying one at a cooking class. Much to my surprise, I like them raw much better than I ever liked them cooked (although I am rather fond of a good fried oyster). So far, we’ve tried Pacifics, Kumamotos and our native Olympias. I have found that I do like a spoonful of mignonette or a tiny dab of sriracha sauce, but on the whole oysters really are best just in their own briny sauce. Now that we’ve really gotten on the oyster bandwagon, I suspect we’ll be making a lot more trips out to the farm. Maybe we’ll eat clams more often, as well. However, despite the rather delicious geoduck ceviche we had at Licorous, we will probably not be buying a lot of geoduck. It just seems unnecessary. 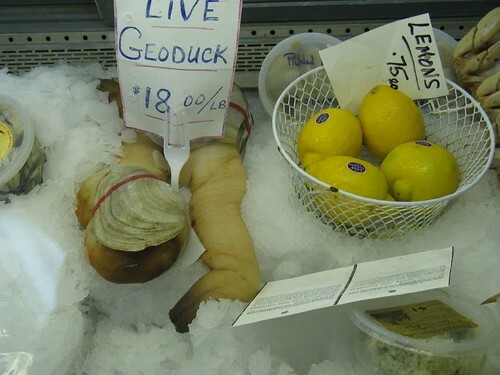 Isn’t the phrase “buying a lot of geoduck” rather redundant? Can you buy less than “a lot”? I have a very difficult time staying away from Taylors. 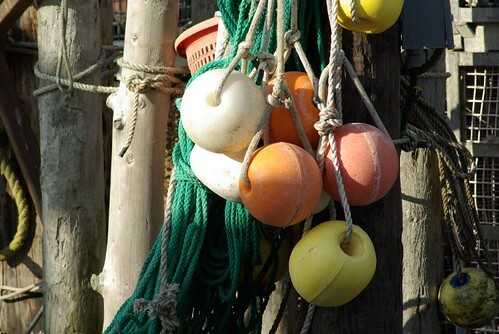 If I had the time, it would be very difficult for me to not be playing with crab pots or digging in the mudflats or plucking bi-valves off the shores and slurping them down. 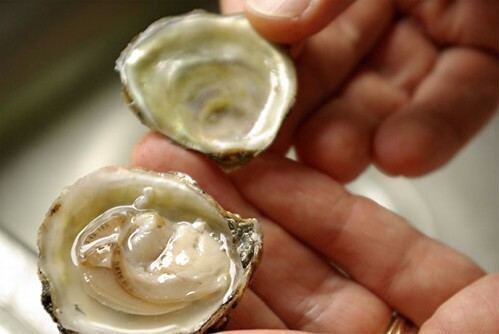 so what’s your favorite thing to drink with oysters? We had a dry cava with these that was pretty nice, but it didn’t really hold up to the metallic aftertaste of the Olympias. A dry French Muscadet… very acidic. Aligote is a slobber generator also. I like a thin white bordeaux that’s mostly Sauvignon with a hint of grassiness… maybe a seaweed-like twist to that? And just because local goes with local… a dry Madeline Angevine. PS.. if all else fails… beer.